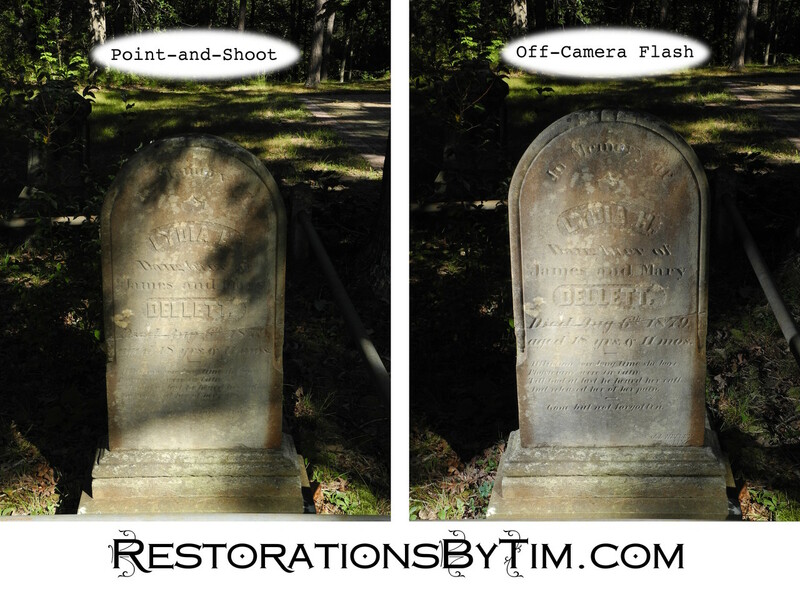 The Majesty of Side-Lit Gravestones | Photo Restorations by Tim G.
The next big thing, not only in my own genealogy, but also for the genealogical research services that I will begin to offer this fall, will be gravestone photos lit from the side by an off-camera flash. I’m hard pressed to imagine a better method for photographing gravestones. This method produces higher contrast without recourse to smearing foreign substances onto the fragile monuments with grubby hands. No chalk, no flour, just pure white light. 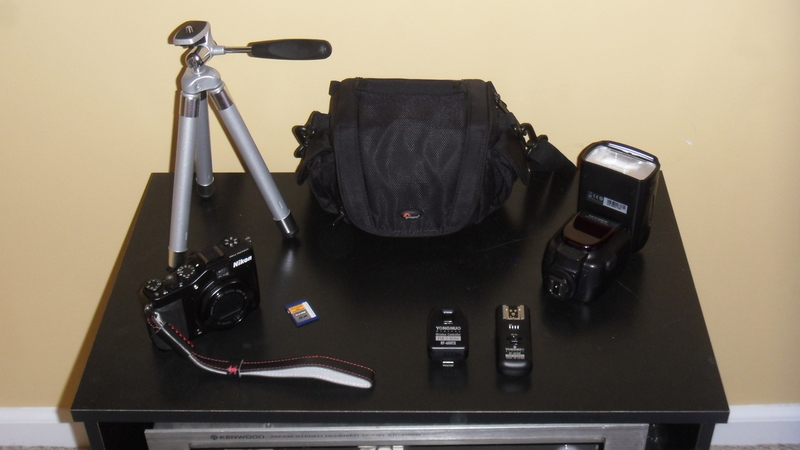 What I’ve collected here is a Nikon P7000 camera with SD card, a Neewer NW-561 Speedlight flash, a Yongnuo RF-602/C wireless flash trigger transmitter and receiver set, a Julius Studio 44″ portable mini tripod, and I’ve managed to cram it all into a Lowepro Edit 110 carrying case. In practice, the flash gets mounted onto the tripod, which I stand next to the gravestone as I hold the camera to take the the photo. How well does it work? It took me a little manual browsing and tinkering to set up the external flash. Having managed that, I first tested my equipment at a tiny old cemetery I found on the outskirts of the Wharton State Forest in New Jersey, en route to my recent camping vacation there. St. Mary’s in the Pines Catholic Cemetery was the name of it. Success was immediate and gratifying. For each of the photo sets below, I captured the gravestone using the camera’s automatic point-and-shoot setting, typical of the photos normally would have taken. I then took another photo of the gravestone using the off-camera flash technique. For some of the gravestones, I took a third photograph using the camera’s built-in flash, which you can see is no proper substitute for placing the flash off-camera, beside the gravestone. The built-in flash actually makes reading the text more difficult. All of the photos below were taken in the daytime, a little after 4:00 in the afternoon. Using the off-camera flash brightens the foreground and darkens the background. Each image links to a corresponding memorial on . Click on an image to see the online memorial, where you can compare the side-lit gravestone photos with the images previously uploaded to the memorial. If you would like for me to bring these visual improvements to your genealogy, you may order side-lit gravestone photographs through my Genlighten Store. In the meantime, enjoy these amazing samples. My only regret is not having conserved enough battery power to photograph the whole cemetery in this manner. After exhausting much of my battery during the camping trip, these were the only photos I was able to capture. Perhaps I’ll return to this little cemetery one day. Before then, however, I’d quite like to handle some of your requesrts. Send them on to me at my Genlighten Store, and I’ll be happy to oblige!